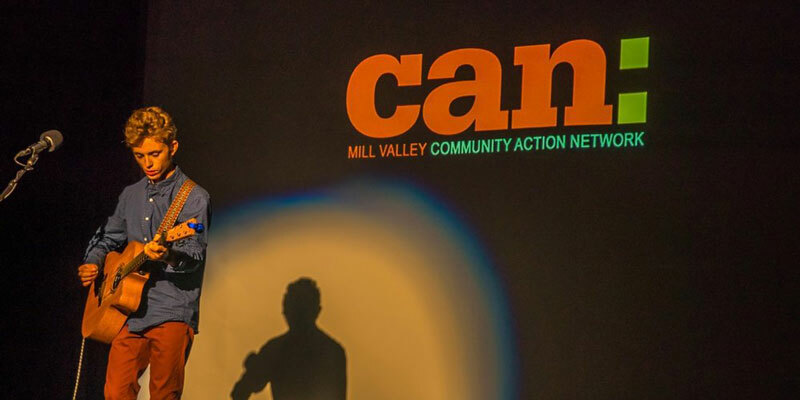 We create special events to engage our community to take political action with MVCAN. Recent events we hosted include the MVCAN Anniversary and our Memorial Day Float. Learn more and join our team! We create special events to engage folks to take political action with MVCAN. Would you like to help produce new events in 2018? Are you a community organizer? Do you have creative, stage or video production experience? Please email us at events-lead@mvcan.org if you would like to join us. Our Events Team includes artists and organizers with a wide range of talents: Danny Altman, Mary Cosgrove, Fabrice Florin, Carol Korenbrot, Marilyn Price and many more. Learn more about our work below. In fall 2017, we produced the MVCAN-Do Revue, our first anniversary fundraiser for MVCAN. This enchanted evening of music, art and storytelling took place at the Throckmorton Theatre in Mill Valley, on November 11th. We featured local performers including Matt Jaffe, Reed Fromer, the Shady Ladies and RoCo Dance. Learn more about the MVCAN Anniversary. Impact: This event energized hundreds of participants, raised funds for MVCAN, signed up new members and raised awareness for our causes. In spring 2017, we created the Bamboodu Theatre, a political art float for the Mill Valley Memorial Day Parade on May . This political art performance aimed to express our frustration with the Trump regime and the republican takeover of democracy. Our puppet theater on wheels starred Lady Liberty and Tiny Trump: each time Trump tweeted fake news, Liberty bonked him on his thick bobble head. A chorus holding Liberty statues sang along the poem ‘Give me your tired’, as we marched for democracy. Learn more about the Bamboodu Float. Impact: Our parade float won the ‘Community Spirit Award’. It was the cover story for the Independent Journal. ABC 7 News featured our political art widely, reaching millions of TV viewers. We signed up a lot of new members that day. Our creative team of artists and organizers produces a range of events like these, to inspire people to find their voices and help build a better world. We find that combining art and politics engages us deeply and unites us around shared emotions. These events spread our message to a wider audience. They help build community and get more done together, through fun and inspiring activities. In 2018, our team plans to host a series of events with members of our community, in collaboration with other MVCAN teams. We are now considering ideas for events we could produce together this year, and will pick a few to focus on, based on feedback from our community and team leads. To help us plan future events that serve your needs, please take our short survey about the MVCAN Anniversary and our next event ideas. To learn about upcoming events, check our events calendar.